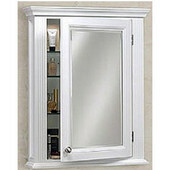 Semi-recessed medicine cabinets provide more storage space in your bathroom. Since part of the medicine cabinet is recessed into the wall and the rest of the cabinet is outside the wall, the medicine cabinet has a greater depth, offering additional space for larger items. 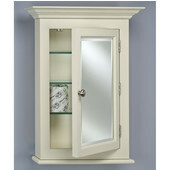 Glass shelves store all your toiletries and other important bathroom items and keep them out of sight. 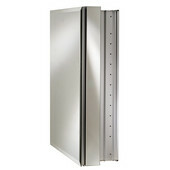 At KitchenSource.com, we offer semi-recessed medicine cabinets from top manufacturers, including Afina Bathroom Cabinets and Empire, in several styles to complement any bathroom design and accommodate any bathroom configuration. 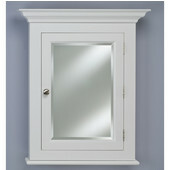 Update your bathroom with a new semi-recessed medicine cabinet from KitchenSource.com. 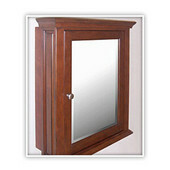 You'll find a fine selection of quality medicine cabinets from which to choose.